Here’s a quick update on three mysteries I’ve recently finished. To Die But Once by Jacqueline Winspear. By far my favorite of the three books was this Maisie Dobbs novel which is the fourteenth in the series. More British young men are called to serve in the war against Nazi Germany but for those not going to enemy lines, there is much work back home. Sometimes dangerous work. After Joe Coombs is found dead Maisie discovers it was foul play and all signs point to the work he was involved with painting buildings with some new fire retardant chemical. What I loved about this book is that it reminded me of some of the earlier Maisie Dobbs books. The first chapter was very moving as the young man meets an untimely death and I though the author did a fabulous job of making you feel for the character and of the unfairness of it all. Even though there were some sad moments there is the potential for some exciting beginnings in Maisie’s personal life. I’ve always enjoyed this series and this entry does not disappoint. The Dark Angel by Elly Griffiths. The very relatable and likable Ruth Galloway, professor of archeology, finds herself going off to a village in Italy to help a friend identify some bones. It’s the first time in a long time that Ruth has had a getaway and with so many changes in her personal life she thinks this will be just what she needs to find some peace but life is not so simple and a murder and earthquake later have Police Inspector (and love interest) Harry Nelson running to meet Ruth. Nelson has not been the most sympathetic of characters and in this installment he’s really annoying actually. He rushes off to Ruth’s side even though he is still very married and with a pregnant wife. His wife though may be pregnant by another man. What? Yes, and I won’t even go into some of the other things that happen. Basically, too much family drama and not enough mystery. Why is Ruth not getting on with her life without Nelson. I know I’ll come back to this series but I really hope the next book isn’t like this one. Bookmarked for Death by Lorna Barrett. This cozy series take place in a booktown and one evening after a local author, Zoe Carter does a book reading and signing at the local mystery bookstore, Haven’t Got A Clue, she is found dead in the bathroom. Will sales of her series skyrocket? Who benefits from her death? And why do so many locals who knew her say they never had a clue she could write? Bookshop owner, Tricia Miles, is kicked out of her shop while the local police search for evidence but she’s got a few questions she wants to answer for herself. This was an audiobook and I think I would have preferred an actual copy of the book because all of the character dialogue sounded forced and some of the characters sounded just like brats. I thought this would be a fun series and instead I didn’t really like many of the characters. I really liked the first book in the Maisie Dobbs series, but I still haven’t gotten around to reading any more of them. This is my MIL’s favorite series, though! I’m behind on the Ruth Galloway series, but it’s another one I really like. Cozy mysteries are a hard sell for me, so I probably wouldn’t have picked up BOOKMARKED FOR DEATH anyway. It sounds like we have similar tastes in mysteries. What are some of your other favorite mystery authors/series? I loved the first books in the series. The later books haven’t had quite the same feel. The last one I read was Journey to Munich, so I have two books to catch up on! Duh. I’m talking about Winspear’s Maisie Dobbs series, of course. I haven’t read The Dark Angel, but I did enjoy the other Elly Griffiths books I’ve read, both in her Ruth Galloway series and in her Max Mephisto one. I haven’t read any of these but I’ve read others from the first two series and Lorna Barrett’s book sounds like an old series I used to enjoy by Jo Dereske, featuring intrepid librarian Miss Zukas. What fun (but silly, yes)! 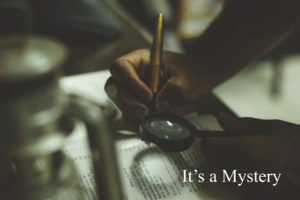 Susan (Bloggin’ ‘Bout Books) – I do love a good mystery. Some of my favorite authors are Louise Penny, Sharon Bolton, Peter Robinson, oh gosh, I could name so many others. Would love to hear more about what series you like! And, I do hope you check out more of the Maisie Dobbs books. Jen Mullen – I agree, those first books were really good. There was something about this one that really reminded me of the first books so that’s probably why I enjoyed it so much. Lark – I still haven’t read her Max Mephisto series and need to check that out! BuriedinPrint – I’ve heard of the Miss Zukas books. Yes, cozy mysteries can be a bit silly sometimes but there are some that I don’t mind. Good fun to break up the more dark thrillers I tend to read!